Curtains for glazed balconies are selected in the case that you need this part of the room to make a shade. Especially when the balcony is on the Sunny side of the house. For suitable balcony curtains made of durable materials and easy to clean from dust and street dirt. The most common types of curtains today is the classic fabric Roman and roller. Depending on the kind of display are different. When mounting a classic fabric curtains on the balcony will have to determine their height. The most classic option – the ledge located above a glazed frame 10-15 cm, if the height of the balcony. Under low ceiling mount cornice at an equal distance between the ceiling and the frame. For hanging classic fabric curtains on the ledge, use plastic hooks that usually go on sale alongside the eaves. It is also possible to maintain curtains use self-made loops on the back side are fixed with buttons. Or use ring-grommets sewn into the fabric. For fabric curtains, if they are hanging on the balcony, care is difficult. They look impressive, but are quickly spoiled. So give preference is tulle, chiffon or calico with dark shades. For Roman blinds the ledge above the frame of the balcony glazing install depending on their height. To the eaves Roman blinds attach construction stapler. If this is not an option, the curtain mount is not on the ledge, and directly on the frame glass balcony. In this case, the size of Roman blinds to choose the perfect size of each glass part. Unlike roller blinds, Roman when tightening them up to form a large smooth folds. 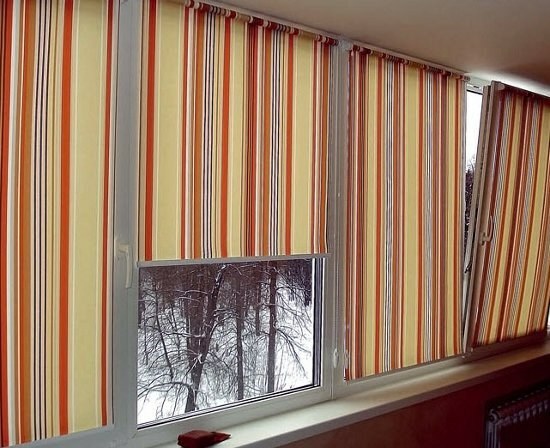 Very easy to care for and easy to install anywhere blinds. For balcony roller blinds are a godsend. Mount them on the upper frame of the glass surface, and above it, on a concrete basis, the loggia, the dowel-nails. Roller blinds are mounted on the surface as well as blinds. Curtains are attached at the top by a ledge or plank. Side set spring design, for which the curtain can be spun into a roll or spin the whole length. Mounts, curtain rods roller blinds can be sold together with the curtains. If they are in the package no additional hardware for mounting roller shades should purchase the same brand.